I'dd like to introduced my dog to you. Hi, Corrie. Bluf is heel mooi (very beautiful). I looked this up on Google Translate. 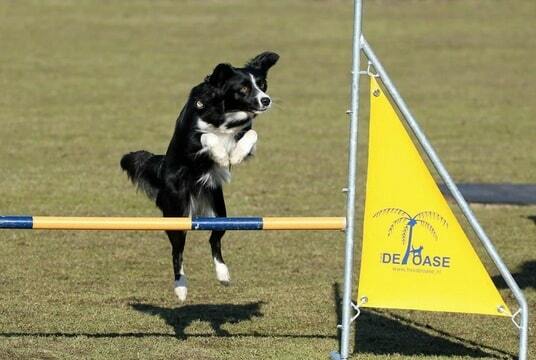 The white markings are much like a Border Collie but I know that Markiesje is a spaniel type breed. I like the intense look on her face. That is a very impressive list of sports that you enjoy together. Yes she is looking very much like a Border Collie. 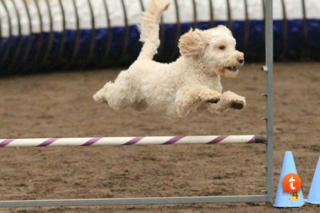 But indeed (super , you know that) the breed is a Spaniel crossbreed. 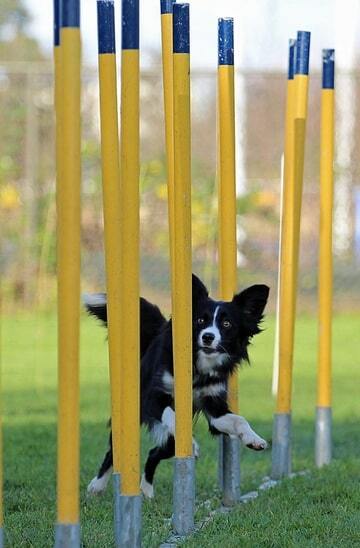 It's a great working dog. Corrie, I have to admit I cheated and Googled Markiesje before I answered you. The all black ones I saw pictures of look much more like spaniels than does Bluf. I like her name as well, especially if it translates as google says, "Boast". I run 2 Papillons that are also spaniel types. One is typical conformation but the other has short hair and a big tail. 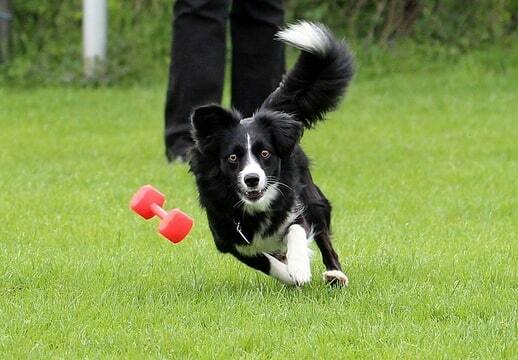 When people ask, I tease them that he is a red and white 'toy' Border Collie. You know that they used Papillons as a crossbreed to bring back the race Markiesje in The Netherlands? They also used a Stabijna, thats another Dutch breed. Markiesje where extinct and in the years 1970 they breed back the race. There are now about 1000 Markiesjes in The Netherland. Corrie, your girl is adorable! I love that her markings resemble a border collie. What a cute breed, I hadn't heard of them so I had to google them. I had also not heard of treibball, so googled that... sounds fun! I'm sorry, Corrie. I just noticed this post tonight. Yes, I have another Papillon named Sparkle. She looks as papillons are supposed to. She has the long hair on her ears and the small 'pom-pom' tail. Thank you and I agree they are great dogs. No, I didn't know that about the Markiesjes. Very interesting. They must be great dogs if they have papillons in the family. I'm also a fan of Kooierhondjes. They are rare in the US. But there is a breed called Nova Scotia Duck Tolling Retriever here. They are about the same size as Kooikers and also used to decoy ducks into nets. Unlike Kooikers, they are mostly red with white markings. So I'm returning some history lesson of Canada and USA! Picture of Sparkle taken by Cheryl Gilbert. 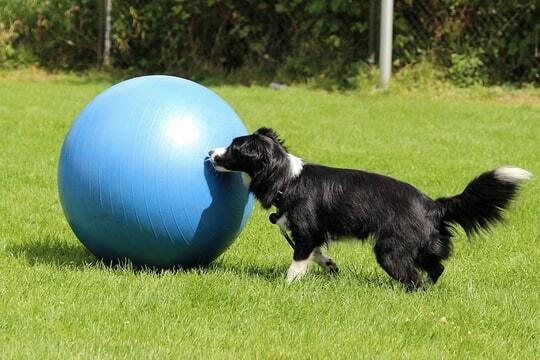 Yes Treibball is a great sport to do, the dog have to bring eight big balls towards the handler in to a goal. 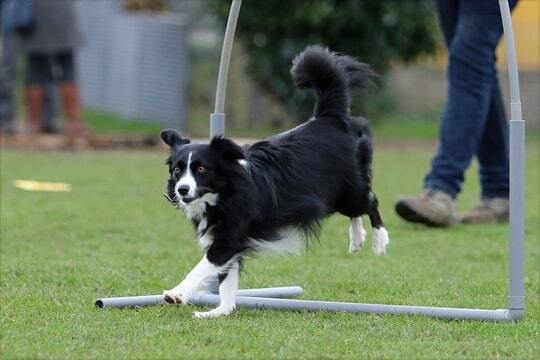 Hi Richard, In the Netherlands a Papillon is very populair in the agility sports, they are doing great in the small classes. I know the Kooiker well , one of my students breeds them. In the Netherland the Novia Scotia Duck Tolling Retriever is also known , very nice retriever dogs. Wow what a fantastic group of dogs you all have. 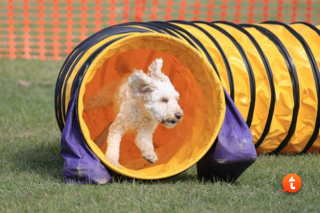 This is my agility boy Samson who just loves working with his mum. He is a 4 year old Groodle and a great little dog. We are working hard on our distance handling at the moment. I retired my 15 year old lab mix, Ezri, this past weekend. Here is a picture Priscilla Wornack took of us as we were walking to the ring for our last run. It's priceless! Beautiful picture!!! Welcome to retirement Ezri, you deserve and will love your special times on walks together!